It's about all of US learning. Disclaimer :) All grading can change based upon projects, assignments, etc. The following are not set in stone and may change. Most of what goes in the grade book are larger tests and projects. Those things are worth a lot more than in-class/homework assignments. I view in-class things / homework more like practice. Most tests are worth 100 points. Most Interactive Notebook Unit Grades are worth 50 Points. Projects can range from 20-200 points depending on the depth of the project. Homework / Classwork is given feedback and not necessarily entered in the grade book. There is a final exam at the end of the year that will encompass major themes throughout the year. Below is the 5 Word GPS for this school year. 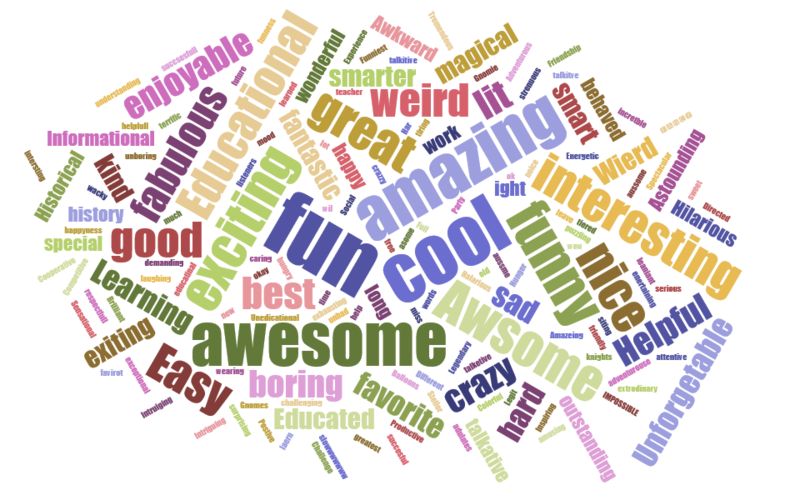 All the students were asked during the first week to come up with 5 words that they wanted to describe this class at the end of the year. The far right is the top 250 words. The middle is the top 25. This will be my goal/guide as I try to make the classroom experience match up to these top 5 words. Fun was the number one word.